Alfred Hitchcock was once called the greatest director of screen melodramas by the British press. This was during his first period in England, probably in relation to the 6 thrillers that constitute his best British work. A forgotten and very hard to find film (in retrospectives, at least) made in the US, Under Capricorn, is probably Hitchcock at his melodramatic best. It is not a suspense picture, though it resembles one. This might be one reason for the film’s commercial and critical failure. Under Capricorn isn’t a great film, but it is not boring. I’ve seen it three times in maybe 5 years, and it’s most effective the less often you see it. Hitchcock’s best pictures can be viewed over and over again, but Under Capricorn is preposterous and over the top, laden with actors with incorrect accents (the two leads!) and a soap opera plot. It tells the cruel history of the colony of Australia, once used by the British as a detention camp for criminals. The society, such as it is, is limited, and many of the colony’s most prosperous citizens were themselves inmates, many often sentenced falsely accused. Sam Flusky, an Irishman from the time when the UK ruled with violence, is such a citizen, a man who with his first freedom made himself a success. Into the colony comes Charles Adare, a carefree cousin of The Governor’s. Charles is warned against keeping an engagement to Flusky’s home, but against reason he visits the haunted mansion and partakes of wine and dinner. It is here we meet Flusky’s wife, Henrietta. Their love affair resulted in scandal, and the death of Henrietta’s brother. Because he did not fire the first shot, Sam got 6 years at the colony. Henrietta, madly in love, fled to Australia to be near her love. In the first of the many story conveniences Charles knew Flusky’s wife, Henrietta, back in Ireland; his sister was good friends with her family. Henrietta is obviously drunk when we first meet her. She stumbles into dinner barefooted with nightgown. She solemnly refuses a drink from Charles. Charles, with permission by Flusky, is determined to cure Henrietta of her malady and make her popular among the socially aware and mistress of her own house, which is currently run by the pushy maid, Milly, who carries a secret passion for the Mister. 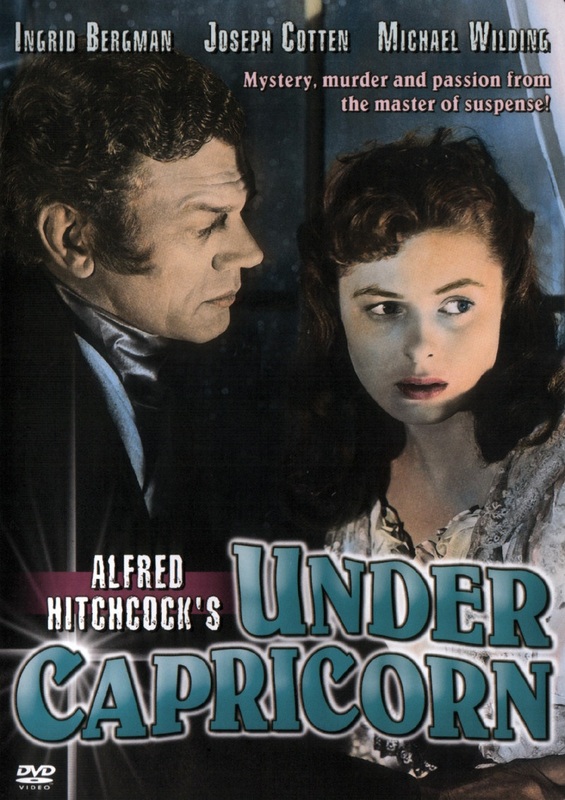 Under Capricorn was Hitchcock’s second color film and a project during a quasi-experimental phase in the director’s career. He was brought to America by producer David O. Selznick. The two did not get along. Selznick, a tyrannical producer, allowed the director little freedom, and when the contract expired Hitchcock became his own producer. His film solo film, Rope, was technically brilliant but nearly put an end to Hitchcock’s newly formed production company, Transatlantic Pictures. Rope is a film that exists with very few aesthetic cuts. Hitchcock wanted the feel of a stage play by having 10 minute sections of the film shot in real time, and all but two “cuts” are seamlessly dissolved to create one single-take picture. Under Capricorn might have been Hitchcock’s realization that his desired technique couldn’t work as cinema, so while he still peruses it in Under Capricorn, the image is livelier with cuts and more visually pleasing camera glides and pans. The approach suits well the material of Under Capricorn. When Charles and Flusky speak of Henrietta on the porch, the camera glides effortless up the house, into Henrietta’s room, showing the audience her in drunken turmoil. The very first extended take, Charles walking into his cousin’s room, has grace and well-meaning, but the limitations of Technicolor technology, namely the heavy weight of the camera, are evident as the camera bounces to the cameramen’s walking motion. This brings up a point I would like to discuss. When I saw Under Capricorn at Harvard recently, filmmaker Morgan Fisher introduced the film, speaking beforehand about how 35mm negative can only run for 11 minutes in the camera, and allowing for roll and slate, slightly less. He noted that if one of the long takes is fouled up 4 minutes in, more than likely the roll of film would need changing because the time allotted for the shot was in direct conflict to the remaining time left on the used reel of film. It’s an interesting piece of info. Also, when Hitchcock’s camera moves from one part of the set to another, every area has to be lit perfectly in advance. Unlike Rope, which took place in one apartment in two different rooms, Under Capricorn moves all about, into previously closed doors, up the sides of buildings and stairs, and that each section of the set needed to be factually constructed and pre-lit is an enormous undertaking for the crew. Fisher suggested that while watching these films, the audience is made aware of the life behind the camera. I don’t agree. Hitchcock was a skilled filmmaker. Not only did he take risks, he knew how to make them work. I think the whole of his artifice blends away when he puts the pieces of film together, no matter how long each segment. Only film people might be aware of how Hitchcock shot this film. Average viewers unfamiliar with the inner workings of filmmaking won’t be conscious of Hitchcock’s efforts. I certainly wasn’t. After studying the man and his work, I am still suckered into to his stories and cannot see the seams. I won’t linger on it but Technicolor is stunning. The print I saw was a BFI restoration and it was beautiful. Most DVD production companies when working on three-strip Technicolor alter the tone and intensity of the color to make it look contemporary. Technicolor is supposed to have a subtler palette than we’re used to. Most of Under Capricorn has a grayish look, partly because of set and costume design, but the palette was softer than I was expecting. Only The Criterion Collection’s Technicolor releases retain a film-like look among American DVD production houses. Thankfully, Image Entertainment’s excellent DVD of Under Capricorn does, too. Until seeing the BFI restoration on screen I was convinced Image used a bad print, but their DVD seems to have used the same restoration. I noted only two differences: the blue introductory titles cards regarding the restoration are missing on the DVD, and overall the film has a slightly more faded look than the 35mm print, but fans eager to see Hitchcock’s rarest Hollywood film should not hesitate in purchasing Under Capricorn on DVD. It’s melodrama and it’s rip-roaring. It’s silly and fun and gothic. In many ways it reminded me of other sources, most notably the novel Jane Eyre. Rochester is a cursed man in a castle both shunned by and shunning society. He is closed off from emotion and depressed at the reality of his situation. Henrietta represents both Jane, the new servant girl who gives Rochester life after so much darkness, and Rochester’s long-suffering wife. This parallel, at least in cinematic circles, becomes even more appropriate when considering the various 20th Century adaptations of the novel, and of the novel Rebecca. Rebecca was Hitch’s first American film and one of his greatest and best surviving films. Orson Welles’ radio adaptation of “Rebecca” was scored by Bernard Herrmann, a composer who would make the greatest contributions to 20th Century music working in film, and specifically with Hitchcock in the 50s and 60s. Herrmann scored the greatest film adaption of Jane Eyre, starring Orson Welles, and adapted his radio score for Rebecca for that picture. Under Capricorn is in the gothic tradition, where morality and social obligations counted more than one’s happiness. Flusky wants his wife cured of her illnesses so that she may be happy, but that she cannot help herself weighs heavily on him. Milly, the maid, doesn’t help. This is another throwback to Hitchcock’s Rebecca. Milly is very much like Mrs. Danvers, obsessed over the person she serves and willing to kill those who threaten her own happiness. One thing I felt the film did terrifically, or at least as honestly as the Production Code would allow, is show what’s it’s really like for someone dependant on alcohol. Ingrid Bergman’s Henrietta is a slave to her drinks. In her early scenes it’s the only thing that brings her happiness. It’s quite alarming to see alcoholism so seriously depicted on the screen. The Lost Weekend by Wilder is kind of a joke, but it is like Hitchcock to take a serious subject in a less than serious script and treat it with due seriousness. It is Hitchcock’s much-overlooked strength to supply his movies with honest character portraits. Even in melodrama they are relatable. Joseph Cotton and Ingrid Bergman are terrific actors. Both had been better in other Hitchcock films but given the limitations of the material they do just fine. One thing that initially took me out of the picture was their accents. Both are supposed to be Irish. Cotton, an American, speaks his lines with his normal New York voice. Bergman fares even worse because of her thick Swedish accent, and on top of that she attempts an Irish brogue. It’s kind of amusing at first, but Bergman was great with screen melodrama. In fact all classic Hollywood actresses could figuratively bleed on screen. Maybe it was the era. Bergman could turn her head away in shame or heartbreak as good as anyone. It sounds like I’m making fun, but Bergman was a dynamic talent, especially with terrific scripts. She always is convincing in love, but every time she calls her husband’s name in Under Capricorn I kept thinking of another Sam... The supporting cast is superlative, another Golden Age staple. Margaret Leighton as the villainous Milly and especially Cecil Parker as the governor are simply fun to watch. Parker has a way of delivering lines as only an old-fashioned Englishman can. The least impressive is Michael Wilding as Charles. The role is boring and he matched it. It was easy to see why Henrietta was always passionately devoted to Flusky, even if for the majority of the film their relationship remains a mystery. Supporting the material is the great score by Richard Addinsell. Not to use the word again but it is in the melodramatic tradition: lush, full orchestra giving it all. His music is intrusive in some of the quieter moments but he has some terrific themes and more importantly orchestrations. I recommend Under Capricorn to all eager to see Hitchcock films. It belongs to a series of non-suspense pictures that really come to define the director’s career. We expect the Psychos and North by Northwests but films like Lifeboat and Under Capricorn really showcase the stories and characters that Hitchcock was most interested in. It’s wonderfully over the top.